In the framework of the LIFE Stop CynoBloom project, we carry out regular monitoring activities on the water bodies, where the demonstration of innovative technology for cyanobacterial bloom control will take place. Below, we have presented a description of the most common measurements, which are usually carried out in monitoring activities and help us understand the chemical and ecological status of waters. In the menu »Koseze pond«, you can look at the monitoring results gathered during the season 2014 at different monitoring points of Koseze pond in Ljubljana, Slovenia. Water temperature effects on chemical reactions and biological processes. Higher temperatures speed up the natural processes in water, like microbial activity and their rate of organic matter degradation, photosynthesis of green plants, etc. Water temperature affects also the solubility of gasses in water. At lower temperatures, the solubility of gasses increase. Oxygen (O2) is the most important of the gases, since most aquatic organisms need it to survive. The solubility of oxygen depends on water temperature. The colder the water, the more gases it can hold. The values in the table are found in lakes where continuous mixing occurs, allowing free oxygen exchange between water and the atmosphere. The real values often differ due to incomplete mixing and consumption or release of oxygen by water organisms. Bacteria, plants and animals constantly use oxygen to break down sugars and obtain energy by a process called respiration. Plants produce oxygen in a process called photosynthesis during the daylight. 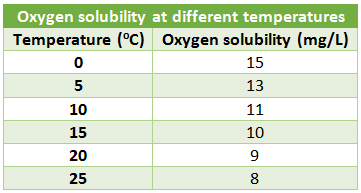 It is therefore not uncommon to find during daylight hours, oxygen values in surface waters that exceed those listed in the table (supersaturation), while at night or early morning before photosynthesis begins they may fall below those values. The water quality standard for oxygen in “warm water” lakes and streams is 5 mg/L. This is the minimum amount of oxygen needed for fish to survive and grow. The standard for trout waters is for example 7 mg/L. pH is an index of lake water’s acid level. It is the negative logarithm of the hydrogen ion (H+) concentration and therefore inversely related to the amount of hydrogen ion in the water. Lower pH waters have more hydrogen ions and are more acidic than higher pH waters. A pH of 7 is neutral. For every 1.0 pH unit, the hydrogen ion concentration changes tenfold. Therefore, a lake with a pH of 6 is ten times more acid (ten times as much H+) than a lake with a pH of 7. The pH is important from the point of view of metal solubility in water. Therefore, in low pH water, aluminium, zinc and mercury concentrations increase, if they are present in lake sediment and can cause toxicity, or phosphorous release if metals were forming phosphate precipitates. Moderately low pH does not usually harm fish, however pH between 7 – 8 is desirable for optimal fish living conditions. Total mass of ions is estimated as total dissolved solids (total mass of material dissolved in water, often noted as TDS), salinity, or conductivity. Conductivity and salinity are commonly used because they are easy to measure by electrical conductivity sensors. Conductivity is proportional to the relative amount of electricity that can be conducted by water. The more dissolved ions present, the higher the conductivity. Conductivity of freshwaters can be correlated approximately to system productivity because high nutrient waters have high conductivity. The value for total dissolved solids does not always exactly correlate to that of conductivity. Only ionic compounds are included in conductivity, whereas uncharged molecules (such as many dissolved organic compounds) also contribute to total dissolved solids. A conductivity sensor measures how much electricity is being conducted through a centimetre of water. Specific conductivity is expressed as Siemens per centimeter (S/cm). Because a Siemen is a very large unit, the microSiemen is typically used (µS/cm) in freshwater measurements. TDS is measured in parts per million or mg/L. For example, drinking water should be less than 500 ppm. One way to measure impurities in water is to measure the electric conductivity of water. To convert the electric conductivity of a water sample (µS/cm) into the approximate concentration of total dissolved solids (ppm), the µS/cm is multiplied by a conversion factor. The conversion factor depends on the chemical composition of the TDS and can very between 0.54 – 0.96. A value of 0.67 is commonly used as an approximation if the actual factor is not known [(TDS) ppm = Conductivity µS/cm x 0.67]. Water clarity is an indicator or measure of water quality related to chemical and physical properties. Water clarity depends on materials dissolved in the water and materials suspended in the water such as algae and silt. We measure water clarity with Secchi disc, a 20 cm diameter weighted white disc with six 5 cm diameter holes (or parts pained in black). The disc is lowered over the downwind, shaded side of the boat until it just disappears from sight, then raised until holes are just visible. The average of the two depths is recorded. Secchi disc readings should be taken on calm, sunny days between 10 a.m. and 2 p.m. since cloud cover, waves, and the sun’s angle can affect the reading. Water clarity index often indicates a lake’s overall water quality, especially the amount of algae present. Secchi disk values less than 0.5m indicates low water clarity. In the case of Koseze pond, we have presented water turbidity data, measured on a regular basis. Tudbidity is caused by particles of matter – materials suspended in the water such as algae and silt. Suspended particles dissipate light, which affects the depth at which plants can grow. Turbidity affects the aesthetic quality of water. Lakes receiving runoff from silt or clay soils often possess high turbidity. Suspended plants and animals also produce turbidity. Many small organisms have a greater effect than a few large ones. Turbidity caused by algae is the most common reason for low Secchi disc readings. Turbidity is measured by spectrophotometer at 700 and 750 nm wavelength. Phosphorus is an important plant nutrient. At high concentrations it promotes excessive plant and algae growth. An analysis of phosphorus often includes both soluble reactive phosphorus (phosphates) and total phosphorus. Soluble reactive phosphorus dissolves in the water and readily aids plant growth. Its concentration varies widely in most lakes over short periods as plants take it up and release it. Total phosphorus is considered a better indicator of a lake’s nutrient status because its levels remain more stable than soluble reactive phosphorus. Total phosphorus includes soluble phosphorus and the phosphorus in plant and animal fragments suspended in lake water. Ideally, soluble reactive phosphorus concentrations should be 10 μg/L or less at spring turnover to prevent summer algae blooms. A concentration of total phosphorus below 20 μg/L for lakes and 30 μg/L for impoundments (manmade lakes) should be maintained to prevent nuisance algal blooms. Phosphorus does not dissolve easily in water. It forms insoluble precipitates (particles) with calcium, iron, and aluminium. In waters with a high concentrations of calcium carbonate (waters with high hardness), it precipitates and falls to the bottom. These waters are often clear, with low algae growth. However, rooted aquatic plants can still get phosphorous from the sediment, so these waters can be weedy. Phosphorous is stored in sediment particles with iron only as long as the oxygen is present. When water close to the bottom loses oxygen, the phosphorous release and algae bloom can appear. Aluminium phosphate precipitate, unlike iron phosphate, is not redissolved when oxygen is depleted. Nitrogen is also an important nutrient for plant and algae growth. Nitrogen exists in lakes in several forms. Total nitrogen is calculated by adding nitrate (NO3–) and nitrite (NO2–) to Kjeldahl nitrogen (organic plus ammonium (NH4+) fraction). Organic nitrogen is often referred to as biomass nitrogen. Decomposing organic matter releases ammonia, which is converted to nitrate if oxygen is present. This conversion occurs more rapidly at higher water temperatures. Aquatic plants and algae can use all inorganic forms of nitrogen (NO3–, NO2– and NH4+). If these inorganic forms of nitrogen exceed 0.3 mg/L (as N) in spring, there is sufficient nitrogen to support summer algae blooms. Nitrogen limits algae growth when the ratio of total nitrogen to total phosphorus is less than 10:1. Values between 10:1 and 15:1 are considered transitional, while lakes with values greater than 15:1 are considered phosphorus limited. However, low nitrogen levels do not guarantee limited algae growth in the same way as low phosphorus levels do. Nuisance cyanobacteria blooms are often associated with lakes that have low nitrogen to phosphorus (N:P) ratios. Cyanobacteria can namely use atmospheric nitrogen gas (N2) dissolved in lake waters as a nitrogen source, while other more desirable types of algae and plants depend on the inorganic nitrate and ammonium forms of nitrogen. Chlorophyll a, a characteristic photosynthetic pigment, constitutes approximately 1% to 2% (dry weight) of planktonic algal biomass. This feature makes chlorophyll a a convenient indicator of algal biomass. However, in the case of harmful algal blooms, we are specifically interested in the concentration of cyanobacteria occurring in the water body and their relation toward green microalgae biomass. For this purpose, a cyanobacteria-specific parameter is required. Phycocyanin is a specific cyanobacterial pigment with specific share in cyanobacterial cells. by measuring fluorescence of the extract at various wavelengths. The concentration of pigments is calculated in µg/L. The activity of plant pigments can be measured also directly from the fresh water samples by fluorescent probes. From the above presented parameters, trophic state of the water body can be determined. Trophic state is another indicator of water quality. Lakes can be divided into three basic categories based on trophic state—oligotrophic, mesotrophic, and eutrophic. These categories reflect a lake’s nutrient and clarity levels. Oligotrophic lakes are generally clear, deep and free of weeds or large algae blooms. They are low in nutrients and do not support large fish populations. However, they can develop food chain with salmonidae fish. Eutrophic lakes are high in nutrients and support a large biomass (all the plants and animals living in a lake). They are very productive, usually either weedy or subject to frequent algae blooms, or both. Eutrophic lakes often support large fish populations. They are also susceptible to oxygen depletion. Small, shallow, eutrophic lakes are especially vulnerable to winterkill which can reduce the number and variety of fish. Cyprinidae fish are commonly found in eutrophic lakes. Mesotrophic lakes lie between the oligotrophic and eutrophic stages. Primary production is increased and occasional algal blooms can emerge. Low levels of phosphorus are associated with low levels of algae (chlorophyll a), which are associated with high Secchi disc readings. 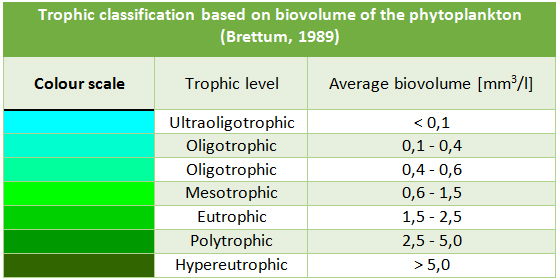 Trophic state of the lake can be determined also on the basis of the calculated average biovolume of the phytoplankton (mm3/L).